Practice your touch typing skills using our typing lessons. Practice your Keyboarding skills using your own text. Practice your touch typing skills using BBC news feed. Practice your Keyboarding skills by typing the article text. 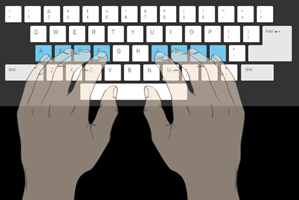 Learn the basic 5 rules of touch typing. The free typing lessons supply the complete "How to type" package. Animated keyboard layout and the typing tutor graphic hands are used to correct mis-typing by showing the right way to type for your learning and practice experience. Lessons' difficulty gradually raises as it starts from only 2 characters and ends with the entire keyboard. When the lesson ends, you can learn a lot from the practice trends: WPM, accuracy and errors distribution. When you practice typing - don't look at the keyboard - not even a quick peek! Look only at the screen. The basic position can be easily found without looking at the keyboard - feel the bumps on 'F' and 'J'. At first typing tutorials, practiced letters won't spell out words. As you get to know the keys, "real" words and sentences will be used. That is the only way to learn typing correctly. Remember to type test your speed periodically. With our typing test you can check for both speed and accuracy progress. The number of words per minute indicates your typing level. If you are still unsatisfied with the results - go back to the typing tutors and keep practicing! Want to improve your Spanish skill? Try our spanishUno product. Play fun games to practice reading, spelling, and extend your vocabulary. Train your most important muscle with fun and challenging games. Using our keyboard tutor and the free online keyboard lessons, you will master the letters and numbers. Each keyboard tutorial supports regular layout ("qwerty") and other ("dvorak", "colemak"…) as well.